Loose parts are an essential part of any play environment for young children. 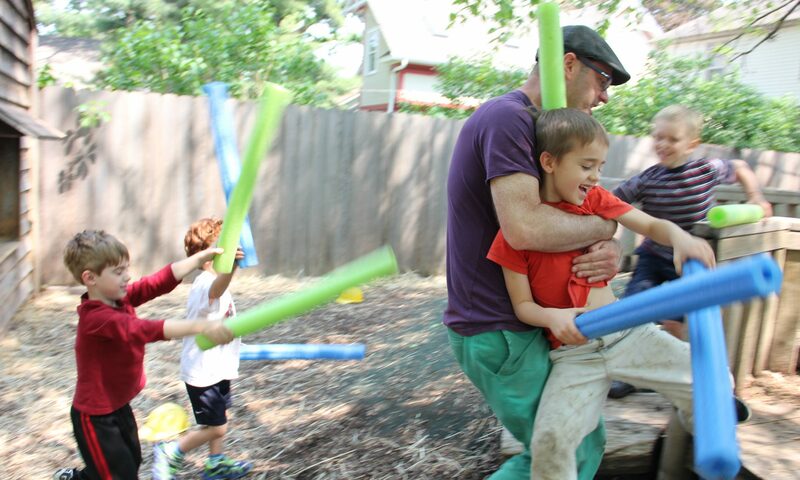 The materials are open-ended so children can play with them in infinite ways. 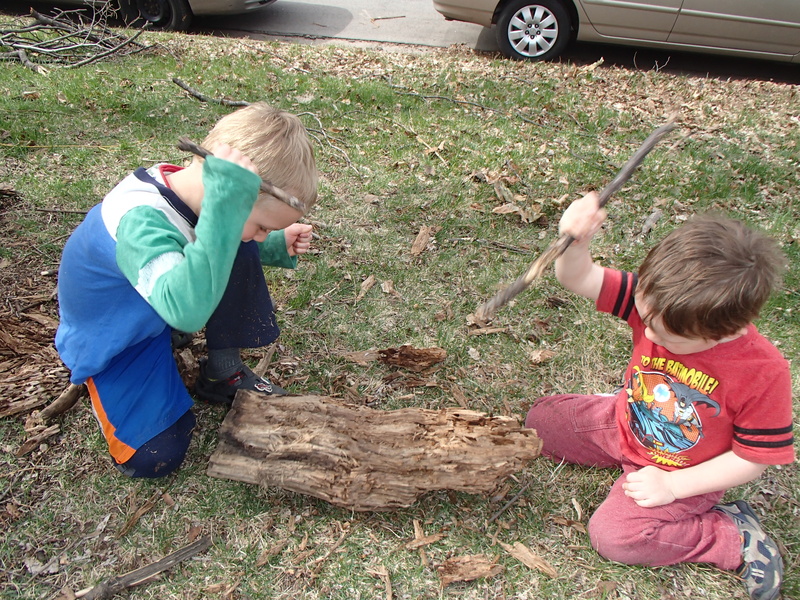 Nature provides plenty of loose parts outdoors: sticks, pinecones, leaves, rocks, etc. We also provide a few other loose parts on our playground such as planks, crates, and tree cookies. Many of these materials can be used in the winter until they are covered in snow. Then snow becomes the main open-ended material on our playground. 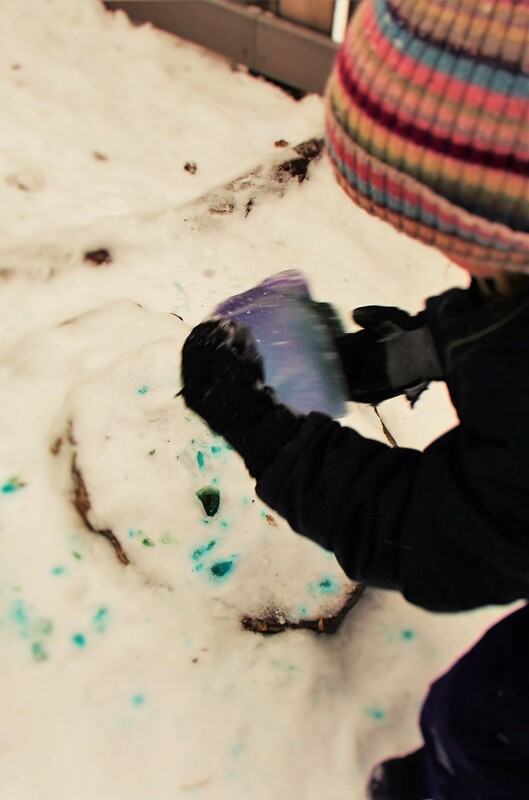 Children can scoop, sculpt, throw and eat the snow. We have a four-foot high berm that the children sled down. This winter we haven’t had very much snow. The last two weeks have been very cold and the snow is packed hard on the ground or has turned to ice. We can still sled, but it has been hard to play with other materials. It’s hard to run or roughhouse when the ground is hard and slippery. It’s hard to use materials when your hands are encased in mittens. Last week we got hit with cold. We had several days where it never got above 0 Fahrenheit (-17 Celsius). I knew it was coming so I had used buckets and other containers to freeze water. I used different colors in the water. 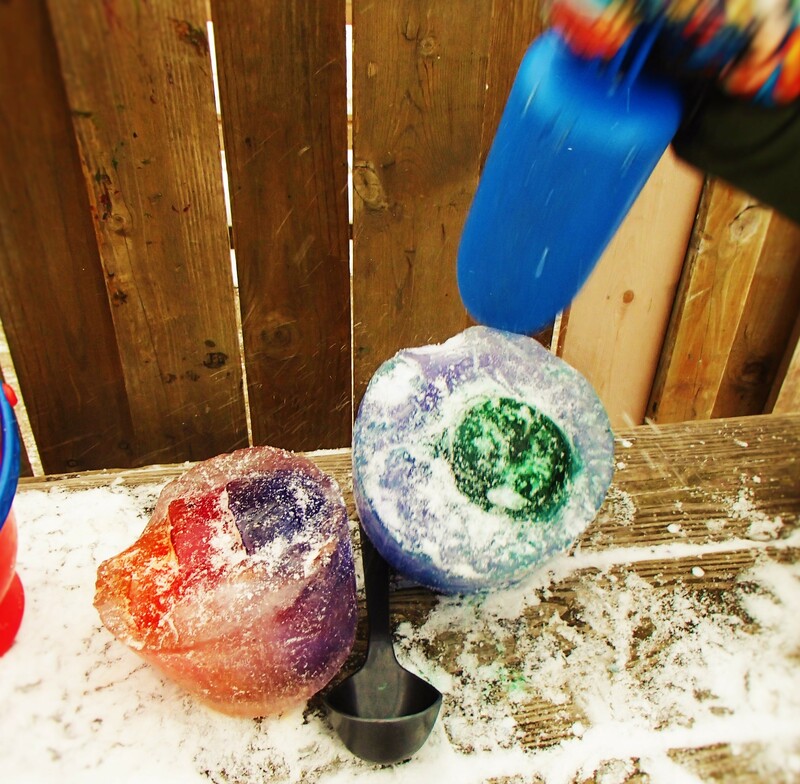 I even used some smaller ice chunks to add to larger molds to make a few multi-colored chunks. The process took a few days. I couldn’t wait to see what the children did with them. On Monday I had the ice chunks spread throughout the playground. A few children called them “magic crystals,” which they quickly collected in a crate. Lance found a large ice chunk about 6 inches across. I was curious what he would do with it. I followed him across the playground. Lance lifted the ice over his head, and threw it on a tree stump. He spent the rest of our outside time trying to break the ice chunks. He tried throwing them against stumps, tree trunks and the ground. He tried hitting them with sticks and shovels. I hate to admit that my first reaction was to tell him not to break them. But I held my tongue and watched. I was curious why he was so determined to smash the ice. I wondered if it was some sort of destructive impulse. Then I realized that Lance never smashed toys. He understood that the ice could be broken. I think he was testing his strength. Could he break the ice? He ended up breaking several of the ice chunks into smaller pieces. The children have pretended the ice pieces were food, power crystals, and other items. They have been collected in various containers, arranged in several ways. 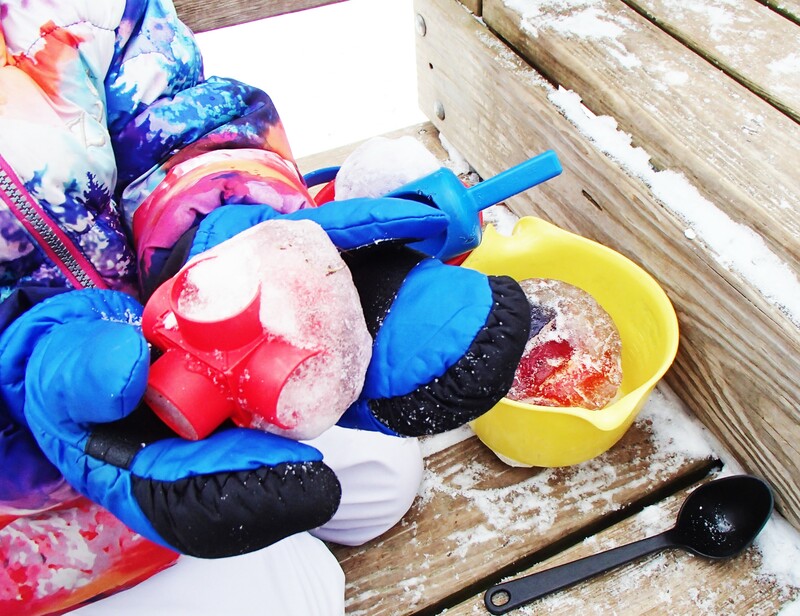 It has now been two weeks since I introduced the ice chunks and the children are still finding new uses. 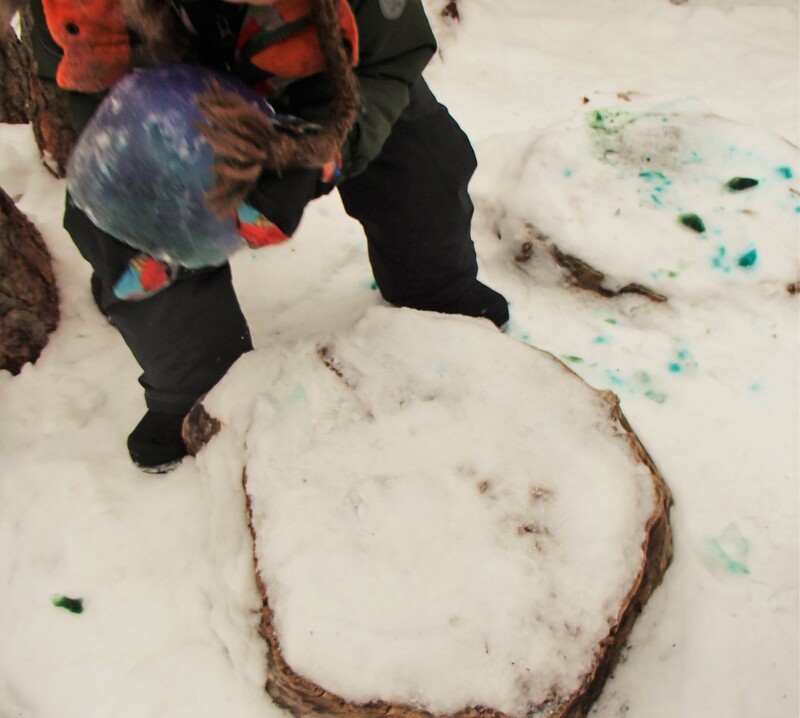 Lance helped turn a handful of larger ice chunks into loose parts that all the children could use. He wasn’t being destructive, he was creating.